1. Do children and families seeking help need to speak and write in English? No. We serve patients who speak English, Spanish, and South/East Asian dialects. In addition, children and their families have been treated in French, Hindi and Urdu; we have offered services in Hebrew and Mandarin: and we have applied for grants to enable us to continue to translate therapy into whatever languages are required to meet the needs of the multicultural communities we serve. Yes. Although one child in the family may be identified as having experienced a traumatic experience, we welcome all preschoolers, children, and adolescents in the family with trauma histories to attend therapy. We provide babysitting for children so that their parents or caregivers are not prevented from attending sessions due to childcare needs. 3. Are caregivers’ spouses/partners welcome? Yes. Because we see the caregivers as the conduits for change in children’s behavior, we welcome the opportunity to work with all of the adults in the home who parent the children. We identify one caregiver who will complete the assessments before, during, and at the end of therapy for consistency. 4. Can families participate in other therapies and participate in services at the PARTNERS Clinic? We recommend that children not receive other mental health counseling during PARTNERS therapy. 5. What type of treatment do the families receive? 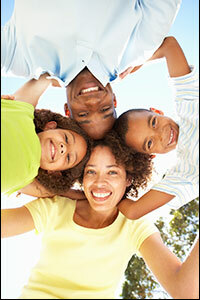 Families receive cognitive behavioral therapy. Cognitive behavioral therapy involves education about typical reactions to stress and skills to address those reactions. Multiple studies have indicated that this treatment has decreased stress in families. 6. What does coming to therapy involve? Families receive 90 minutes of therapy once a week. At first, the 90 minutes is divided into individual caregiver and child sessions. We include caregivers in the treatment to help them develop ways to decrease their own stress and increase their ability to gain their children’s cooperation. Toward the end of therapy, children and caregivers come together with the therapist for family sessions. Therapists are psychologists, social workers, and doctoral candidates in child psychology with specific education and training in the area of child trauma. The program director, Dr. Elissa Brown, and her assistant director, Dr. Komal Sharma-Patel, train and supervise clinicians on evaluations and treatment. Dr. Brown and Dr. Sharma-Patel are licensed child psychologists with extensive experience working with children and families who have experienced multiple forms of trauma. 8. Where is therapy held? Therapy is usually held at the PARTNERS Clinic located at the St. John’s University Center for Psychological Services on Union Turnpike in Flushing, Queens. As part of our outreach efforts, Project CONNECT takes the same evidenced-based treatment we provide at our clinic into community settings, such as public libraries. 9. Why do so many families participate? We try to make the therapy fun. We accommodate families’ schedules by being flexible enough to include evening and Saturday hours. Snacks and baby-sitting are provided. But most importantly, both parents/caregivers and children learn skills that will help them far beyond their participation in the program. 10. Who might not be an appropriate referral to the PARTNERS Clinic? Children or parents/caregivers who have significant developmental delays or are experiencing severe, untreated mental health difficulties, such as bipolar disorder and psychosis, are referred for more appropriate services. If family members with severe mental health problems or alcohol/drug abuse are receiving active treatment to manage their difficulties, they are eligible to participate. 11. How can I share my story about my time at the PARTNERS Clinic? Note: All names and places can be changed for purposes of confidentiality.